What a lovely pleasant place to be. It melted my heart and I'd surely recommend Le Village to everyone. It's beautiful, comfortable, well located (at the heart of Montmartre) and nicely structured. I cannot forget to mention the amazing staff. 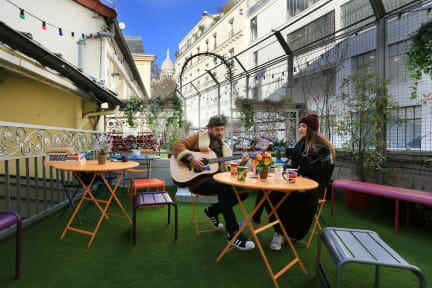 Whenever I go back to Paris, I'll surely go back to this hostel. Melhor hostel! Super aconchegante,com cozinha aberta 24 horas e stafs mega atenciosos! Foi a minha primeira experiência em hostel e gostei muito! As pessoas do meu quarto eram espetaculares, assim como os funcionários do hostel! O terraço é muito agradável (foi onde jantei a minha Sandwich). Voltaria a ficar lá hospedada. I spent one of the worst experiences of my life in this hostel. I confused the date of my chekout and the employee wanted to expel me from the place at dawn. explained the misunderstanding, I paid another night and he let me and my girlfriend stay in the room. I had a horrible embarrassment, staff completely unprepared. I did not indicate.